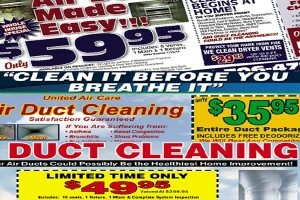 Home » Educate Yourself » Avoid Air Duct Cleaning SCAMS!!! Local ads offering a low price on air duct cleaning can seem like a great deal with minimal risk. While most companies are on the straight and narrow, Better Business Bureau warns consumers to beware of air duct cleaning businesses that employ bait and switch tactics or try to scare the homeowner into thinking they have a serious health-threatening mold problem. According to the U.S. Environmental Protection Agency, a careless or inadequately trained service provider can damage your ducts or heating and cooling system, possibly increasing your heating and air conditioning costs or forcing you to undertake difficult and costly repairs or replacements. Complaints to BBB also show that putting your trust in the wrong company can mean spending thousands of dollars on unnecessary mold remediation services. Most of us aren’t experts when it comes to maintaining the mechanical components of our house and we have to rely on the opinion of the technician. Unfortunately, some companies are taking advantage of that trust by misleading customers and even lying about having a serious mold problem. Customers are baited with low advertised prices, generally through mass mail or local newspapers, for air conditioning duct cleaning services. These ads often include a depiction of a giant dust mite and alarming descriptions of mold, mildew and unhealthy air quality. Once sales agents are in the customer’s homes they run reportedly bogus mold detection tests and tell the owner they must pay thousands of dollars to have the mold removed.